One of my most favorite things in the world is high tea! 🙂 I love taking a break from life and spending a few quality hours of time catching up with my girlfriends over a nice cup (or four) of english breakfast tea. After a super busy weekend, this couldn’t have been more perfectly timed for a 2:30pm sitting time at the Sofitel Brisbane. The last time I was at a Sofitel hotel was in Cairo where I was celebrating the marriage of my darling friends Passie and Michael! Memories that will truly last a lifetime. The Sofitel is gorgeous and the minute you walk in, you can smell the fresh flowers and feel like you’re walking in luxury. The soft greens and touches of pink were perfect and complimented the high tea colors as well. The High Tea Party is a little more intense as it is all day event with a decadent high tea sitting, complimentary pamper stations, tastings, workshops, parades, and a boutique market. We were treated to Guylian Chocolates at each of our place sets as well as in our gift bags! I hate to tell you but I do not like chocolate so it just meant more for the other ladies. 😉 As soon as we were seated, the staff came around to offer us a glass of sparkling wine! 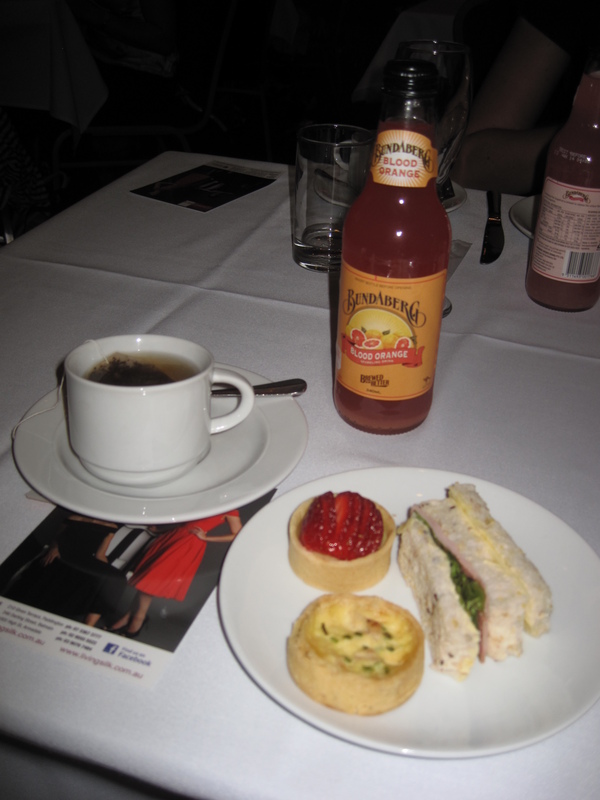 Then, we sipped on our tea as the fashion show with French inspired outfits began. My gal pal, V, won a special table prize! 🙂 We were all taken by surprise but loved how someone at our table was a winner. After enjoying our tea, we went around to the beauty parlor and shopped. I was able to make an appointment for a hairdo. I loved hot it turned out and everyone approved as well. Gorgeous jewelry, wine samples, and perfumes were at our fingertips. We had such a wonderful time and I think that we all felt relaxed and ready to tackle our long week at uni.